"Amok Time" is an episode of Star Trek: The Original Series. It is episode #30, production #34, and first broadcast on September 15, 1967. It was repeated April 26, 1968. This was the first episode of the second season, and the first to air after the series moved to Friday nights at 8:30pm. It was written by science fiction author Theodore Sturgeon, scored by Gerald Fried, and directed by Joseph Pevney. 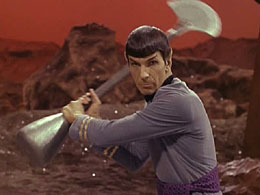 The episode features Mr. Spock returning to his homeworld for a brutal Vulcan marriage ritual. It is the only episode of the original series to have scenes on the planet Vulcan.